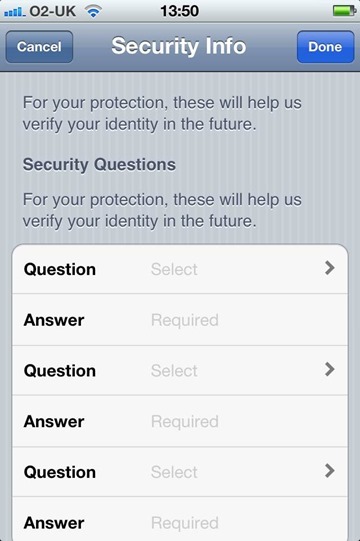 The more popular the App Store has become, the more susceptible users have become to breach of account, it would seem. Naturally, Apple has upped the ante in an effort to combat the potential threat, although as some users have been finding out, the added security measures do seem to bear the hallmarks of a scam. In the past, some users’ accounts have proven fairly easy pickings for those looking to grab a few apps from a linked credit card. Often, the victims hadn’t selected a strong combination of characters as a password, and as a result, found themselves considerably out of pocket as the fraudsters grabbed the most expensive apps they could find. 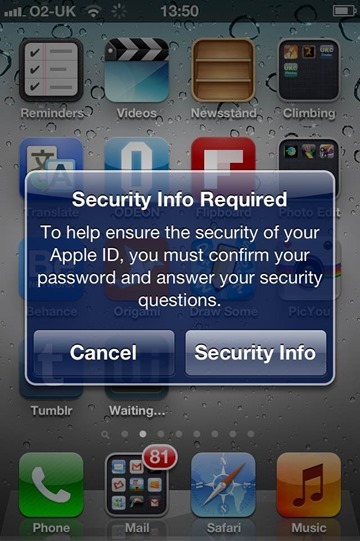 According to The Next Web‘s Matt Brian, the fruit company has been trying to prevent the recurrence instances such as the above, by requesting those with Apple IDs select three security questions and answers when they download a new app or game from the App Store. In addition, Apple also wants users to provide a second e-mail address as a fail-safe, or, as Apple prefers, a "rescue address". Once all of the information has been inputted, a verification e-mail is sent, in which Apple assures customers that the rescue email will only be used in the eventuality that abnormal or suspicious account activity is spotted, and will not be used for announcements or marketing purposes. Apparently, however, Apple has been requesting some users enter the same information via iTunes, which has led to quite a bit of confusion. Some have also suspected foul play, rather ironically believing the official notice and security procedure was indeed the phishing attempt it actually tries to prevent. With the large-scale Flashback Trojan affecting Macs far and wide, Apple’s apparently over-zealous nature in protecting its consumer base is somewhat understandable. Having scrambled to bring forth a Java update to repair the OS X damage, the iDevice range has seldom caught the news for the wrong reasons – and that’s the way Tim Cook and friends would like to keep it. So, to conclude this sermon; if you see a popup like the above when downloading an app, do not fret, since it’s all legitimate, and may prevent you from getting hacked and or fleeced in future.